KATHMANDU, August 18: Olympian Gaurika Singh set two new national records in women's 200m freestyle and 50m butterfly events on the first day of the 20th National Swimming Championship on Thursday. In the championship being organized by Nepal Swimming Association at the International Sports Complex, Satdobato, Tribhuvan Army Club's Singh shattered the records held by Sofia Shah in both women's 200m freestyle and the 50m butterfly event. Singh completed the 200m distance in two minutes and 11.94 seconds and smashed Shah's record of two minutes and 13.22 seconds. Likewise Singh completed the 50m distance in 29.38 seconds to break the earlier national record of 32.6 seconds. 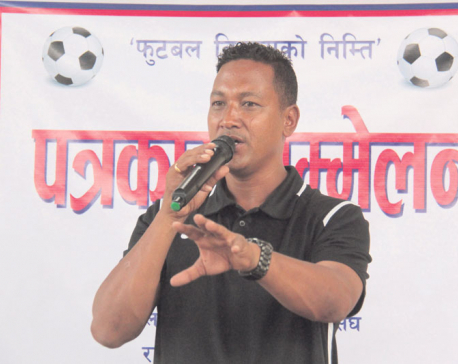 Similarly Duana Lama and Shuvam Shrestha were other players to set new national records in the championship. In the women's 200m breaststroke event, Armed Police Force (APF)'s Lama clocked three minutes and 8.32 seconds and shattered the previous record of three minutes and 12.85 seconds held by Bibidha Rimal. Likewise in the men's 200m breast event, APF's Shrestha clocked two minutes and 36.75 seconds to improve his own mark of two minutes and 42.62 seconds. In the same competition Anubhav Subba of Army bagged three gold medals. He won gold in the men's 200m butterfly, 50m butterfly and 50m backstroke respectively. Rupesh Chaudhari of the same team bagged gold in men's 200m backstroke event while Sameera Shova Thapa became champion in the women's 50m backstroke.